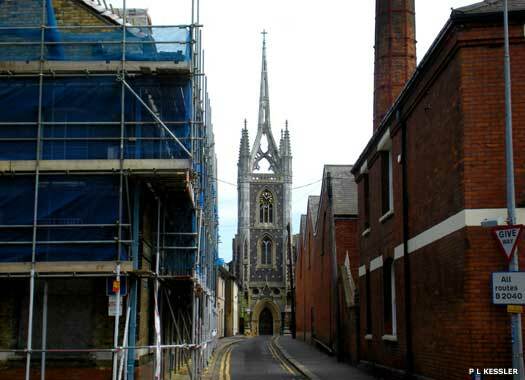 Faversham is a town with a long and interesting history, but Christianity is only documented here from 1070, despite its proximity to Canterbury. 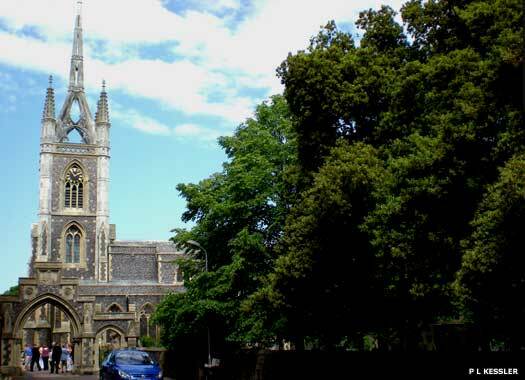 In that year, William the Conqueror signed a charter which gave the parish church of St Mary of Charity to the Abbey of St Augustine at Canterbury. However, Faversham’s parish boundaries were established in about AD 636, which strongly suggests that a parish church was established here around that date. 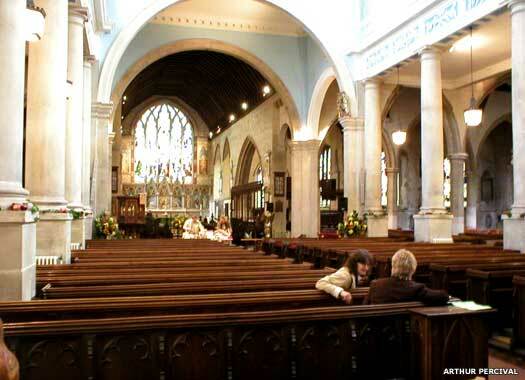 The church, situated at the junction of Church Street and Church Road, is one of the few dedicated to St Mary of Charity. This is one of the town's surviving links with Faversham Abbey of St Saviour, whose mother church in France was similarly dedicated. Construction of the great abbey by King Stephen and his wife was completed in 1147, and the parish church fell on its southern boundary. After Stephen's reign, the abbey fell from favour and was eventually demolished. 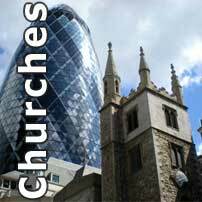 The size of the church is an indication of the town's importance in the Middle Ages. The old medieval central tower and most of the Norman nave were demolished in 1753 after being found to be unsafe. 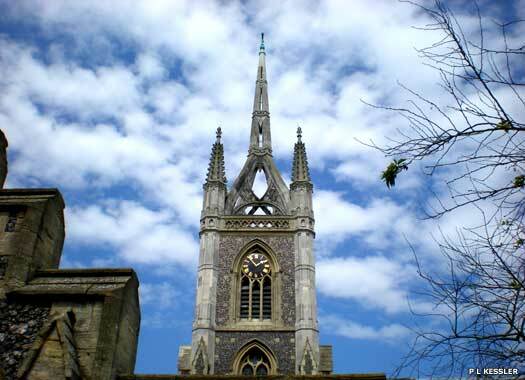 The famous 'crown spire' which is shown here in a view from the churchyard to the south, was built between 1794-1797. The painted column on the left of this photo was put in place in the north transept in around 1320, and survived the rebuild. The choir vestry dates from the fourteenth or fifteenth century. It was probably a chapel initially. Pre-Reformation, it must also have been used as a school, as there are pupil carvings in the crypt below it. The transepts, chancel and north and south chancel chapels were all rebuilt around 1320 after the townspeople had set fire to the church and destroyed the original (presumably Norman) structure. The church also contains two fonts (one Georgian, one Victorian of 1860). 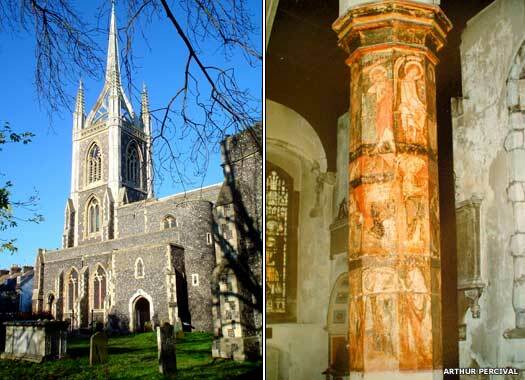 St Mary's also contains a canopy tomb in which the remains of King Stephen are said to have been re-interred after being removed from Faversham Abbey (although it was also said that his bones were thrown into Faversham Creek). Faversham is one of the few places outside London where a king of a united England and his queen (and son) were buried, in this case in the abbey church. The abbey was demolished after 1538, and only a few outbuildings now survive. 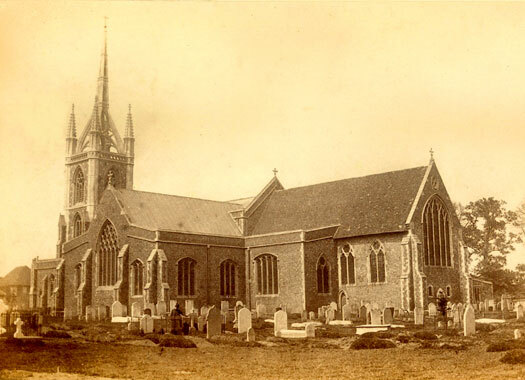 This view of the church looking towards the north-west was taken in 1865 or 1866 by William Saxby, the town's first professional photographer. It is literally impossible to take a photograph of the full length of the church today, because the churchyard is full of trees which obscure the view, even in winter. It's generally said that in terms of floor area Maidstone parish church is the largest in Kent, but in truth Faversham manages to beat it by a whisker. Three photos on this page contributed by Arthur Percival, one by Ralph Wood. Additional text by Arthur Percival.